Where to put limited PGY dollars? 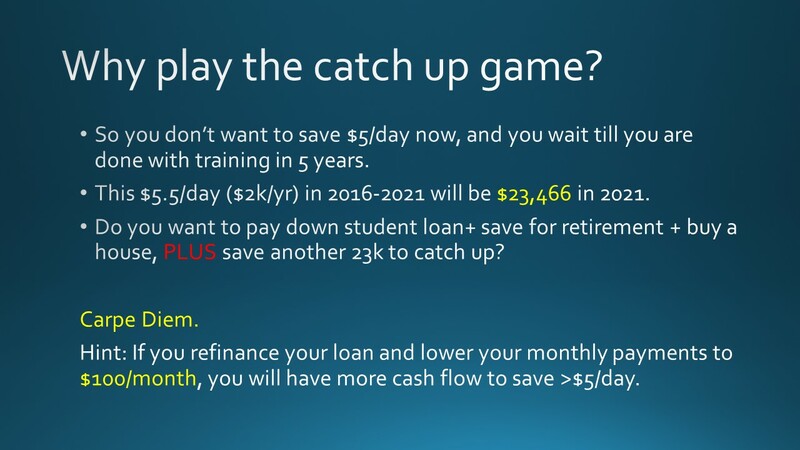 As we become aware of how the time value of $ works against us (student loan interest), we will also learn about how it works for us. After refinancing your student loan, not only do you enjoy paying off an overall smaller student debt but also re-directing freed up cash flow to build your net worth more effectively. The following slides suggest where you can put your limited PGY dollars to work most effectively for you. My current employer Banner offers 4% for retirement contribution, I highly recommend that you find out about and take full advantage of your company match. Instant 100% return through a employer match, on however small an investment, goes a long way. Since Banner offers 4% annual salary match to residents/fellows, a pgy2 can get approximately 2k match for 2k contribution. To claim all the 2k Banner offers, PGY needs to redirect $5.5/day of cash flow towards retirement savings. *So cut the daily Starbucks Latte out and get the hospital coffee instead (free with our meal cards), you will have 40k more in retirement. The following slides explain why I recommend ROTH (post-tax) contribution over traditional (pre-tax) contribution /taxable brokerage accounts. Why I don’t recommend buying MORE clothes with our limited PGY dollars. Where are you putting your PGY dollars? After you see the impact of time value of money, how would you re-direct your cash flow? Looking back to years in medical school, how would you have used your “borrowed” cash differently? That’s fantastic that your internship matches 6.2%! You need to find out how they do the match specifically. Because the 6.2% just tells you that the maximum your internship employer will put in your retirement account is 6.2% of your annual salary (during internship), it does Not specify what You need to do to obtain this awesome additional salary! For instance, my employer Banner will match up to 4% (so your 6.2% rocks! ), dollar-per-dollar towards my pre-tax 401k. This means that on each paycheck, every single dollar I defer into my 401k, will be matched 100% by a dollar from my employer. However, the match can vary by company policies. While Banner chooses to match dollar per dollar, your internship may chose to match 50 cents on your dollar. In other words, every dollar You contribute to your 403b, will be matched with 50 cents from your employer. So if you want to get the full maximum 6.2% match offered by your employer, you will need to contribute 12.4% of your total annual salary. So definitely find out from your internship HR how the match works. Regardless of whether your employer match is dollar for dollar or not, it is still one of the most amazing Guaranteed return, an instant one too! For example, you contribute $100 this coming paycheck, your employer does 50% match per dollar you contribute, instantly, you will have $150 in your retirement instead of $100. That’s incredible. So I would put my money towards First getting the match and then extra into the Roth IRA. You should be able to do both during internship. Compare your interest rate on loans/debts against the potential annualized gain of 7-8% from investing index funds. If you fill comfortable knowing that your debts were about 4% but investment gets you about 7%, then perhaps you put any extra cash towards Roth 403b where you put your post-tax dollars in index funds. If your interest rate on student loans/debts were relatively high (like mine was 6.8%), maybe you feel more comfortable paying down your student loans aggressively because the interest saved with extra payment is Guaranteed unlike the investment return which is Not. If your RePAYE interest rate is lower than what DRB offers and you are happy with the minimum payment required on RePAYE, I would stick with RePAYE until it’s rate gets closer or higher than DRB interest rate. The only reason I’d choose DRB over RePAYE would be 1. DRB interest is lower than RePAYE 2. DRB interest close to RePAYE but DRB payment much smaller than RePAYE (allowing me to put more money in Roth space with cheaper taxes today & getting long term annualized return around 7-8%). First of all, my knowledge on stock/bond or in general for fund is lacking. But, I like the idea of risking moderately for stock portion when considering the fund for the greater potential plus instead of being too conservative. With that said, DWM recommended me low cost Vanguard account (Admiral Share Total Stock Market) for IRA Roth. Also, WCM recommended me either Vanguard Target Retirement 2045 for 403b ROTH and Life Strategy Moderate Growth Fund for IRA ROTH. It seems like I can choose among these options for my IRA ROTH index fund, Admiral Share Total Stock Market vs. Target vs. Life Strategy. Which one would you have chosen if you were to choose again? Curious what your thoughts are on this. Is there a cost to open the account on Vanguard website and when is good time to open it? Is income considered when opening the account? For 403b ROTH, since it is done through HR department at residency program, do they have limited options for me to choose from in terms of which type of index fund? Since I will invest into both ROTH types of accounts for IRA and 403b, do you recommend to have different types of index fund for each or same type of funding for both? I like this post by WCI about investment portfolio. There are so many flavors to it, the most important thing is to have an investment plan a& stick with it. doesn’t matter much at all which index funds you choose as long as its costs/fees are low. Appreciate for the great post! My intern program provides 403b Traditional (pre-tax) account with 6.2% match and immediate vesting. My rad program provides 403b Tranditional and 403b ROTH without match. In my situation, should I just start with IRA ROTH as I start internship? And maybe open 403b ROTH when I start radiology? (I will be able to also max out IRA ROTH each year based on my spending habits/history unless life happens). 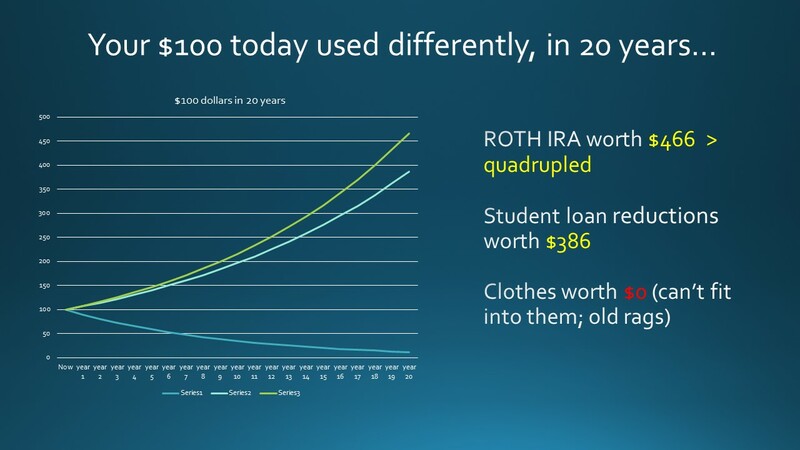 Question is: After maxing out IRA ROTH each year, if I have leftover extra amount still, should I put down extra on paying outstanding interests on student loans vs. putting it into 403b? I think this question will be clear when I earn the actual salary during radiology training with moonlight salary to see how comfortable I can make a choice between paying loans vs. putting more into 403b. Since my program doesn’t have a match, I thought I will just max out IRA ROTH each year and paying down any outstanding loan interests (either REPAYE/PSLF plan or refinance) and not opening 403b ROTH. What is your take on this if you were in my shoes? FYI, I am still awaiting from DRB for my application to process…takes long time! Even though for the first 3 years of PGYs by having lower effective rate under REPAYE compared to DRB rate, would you still refinance now if I will refinance anyway after being on REPAYE only during residency, i.e. not likely pursuing PSLF? That’s perfect. 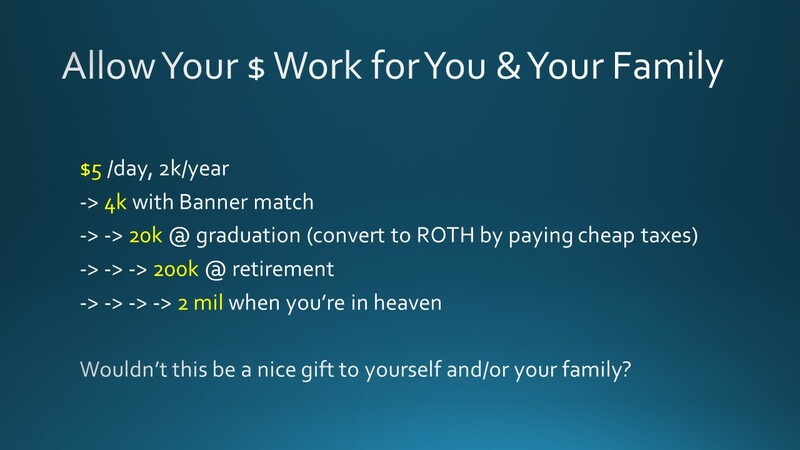 I recommend going for the 403b Roth component, which you can contribute up to $18,000/year. This means to get the max contribution, you will be deducting $750/paycheck (24 of the 26 paychecks) towards your Roth 403b. Did you ask if your employer provide a matching contribution towards your retirement savings? Our program was through the state, University of Arizona, originally didn’t provide match for PGY’s. 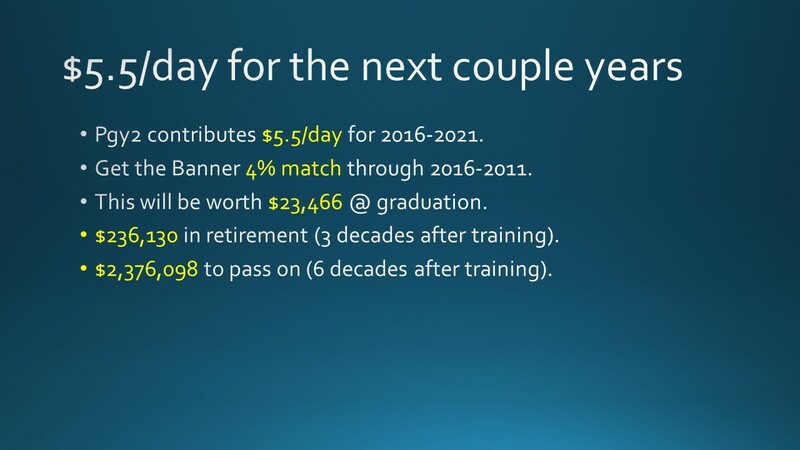 but as UMC got bought off by Banner, we PGY’s can start getting up to 4% per paycheck match from Banner. So even if your hospital currently does not offer a match benefit, I would check with them at least annually. Now while Roth 403b and Roth IRA are both post-tax retirement savings, one major difference is that you can enjoy greater flexibility with Roth IRA, i.e. you can take out the principle amount \contributed anytime without the 10% tax penalty. You can not withdraw from Roth 4o3b until you turn 59.5 yo if you want to avoid the 10% tax penalty. Let’s same you max out your Roth IRA for the next 6 years, with a total of principle contribution $33,000. This means if you want to take the $33,000 out of your Roth IRA for partial down payment of a house, you won’t suffer a tax penalty, and you can take out all $33,000 without paying another dime in taxes. The growth you enjoy over the 6 years, however, can not be withdrawn without penalty until you reach 59.5 yo. So if your employer/ residency does not match your retirement savings contribution, it may be easiest just to open Roth IRA first. If your financial planning indicates that you can contribute beyond $5,500, then set up the Roth 403b for more space to put additional post-tax retirement savings. Plus with Roth IRA, you are in charge and can make decisions are what you want to contribute your Roth IRA funds to. With 403b Roth, there are limited options offered by your employer. Just be sure that you are aware of the cost of the investment you elect for your contributed dollars. Appreciate for your time and reply! I briefly looked what my program can offer. They said they can make 403b or 457b tax deferred annuity program available for residents and fellows. Participants may contribute through payroll deduction up to the IRS limit. I do not know exactly what this means. They also said for 403b, I can contribute on an after-tax basis through the ROTH feature. Thanks for the details, Dr. Liu! How long should I plan to contribute to retirement saving accounts? When (what age) can you take out the money from these accounts? If I don’t max out both accounts, 401k and IRA ROTH, per year, is it still beneficial to contribute from little to some amount each year? Due to interest subsidy under REPAYE, wouldn’t you stay on REPAYE during residency where the effective interest rate each year will be still better than what refinancing bank can offer nowadays? For as long as you are working or until you save enough nest eggs, from which you can safely withdraw 2-4% annually to live off of. At that point, you are financially free to do anything you want. You don’t have to work for a living; you can volunteer, travel the world, or do anything with your time. 401k/403b, you can withdraw at age 59 ½ and pay no early withdrawal penalty tax. With Roth IRA, you can withdraw the Principle at anytime without tax penalty, but for the growth on your principle, you will pay a tax penalty if you withdraw earlier than age 59 ½. 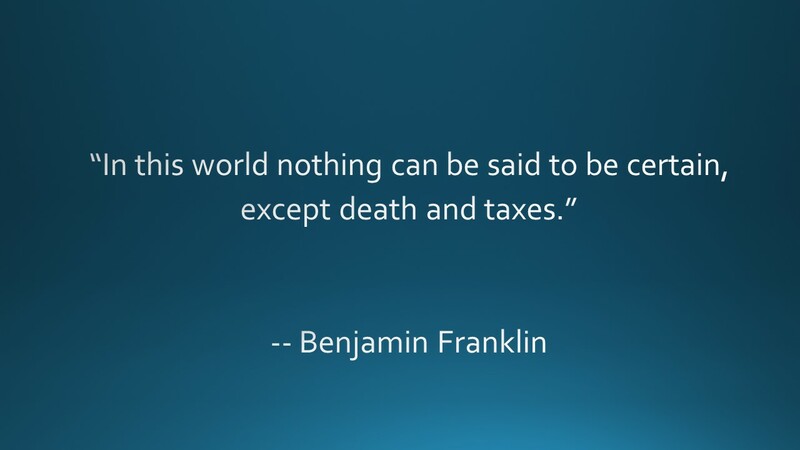 Any money you can invest today in a tax-efficient manner is great. Again, generally you can make 7-8% average/annualized return on each dollar you invest in an index funds (I recommend low cost Vanguard ones). It’s nice to know limits of each accounts so you know how much more you could save in these great tax-advantaged saving vehicles. It is definitely NOT an All-or-Nothing situation. If you can max out any of these accounts, great! If you can’t, save as much as you can. Depends on where you invest your contribution/savings. I select low cost vanguard index funds such as Admiral Share Total Stock Market (with average return of 7-8% for long term investment>10 years.) There are many other choices, more conservative ones are bonds, which I currently don’t use because I can afford risk and want to enjoy potential greater return with stock investment. There are other index funds that may give you even more return, but 7-8% is pretty typical long term expected return on index funds. Since the index funds mimic the stock market at large, there are definitely times you can get Negative return/growth, there are years when you get 13% growth too, but the point is it Averages out to about 7-8% over a decade or more. That really depends on each person’s individual numbers. First of all, everyone has a different true/effective REPAYE (Revised Paye As You Earn) interest rate (due to income, spousal income, family size, etc.) One should calculate what their effective REPAYE interest rate is after REPAYE subsidy. It changes from year to year for each individual. Thirdly, as you can see that investing in index funds gets you average 7-8% return plus some tax savings if you invest in Roth space—pay lower taxes now, and pay no more taxes on principle and growth later upon withdrawal—one may very likely want to put any extra money they get towards 7-8% retirement savings today rather than paying any more than the minimum required on a 5% refinanced student loans. Let me know if you any more question! Regarding the opening up the retirement saving accounts as I will start the internship, where do I start from scratch? How do I open the accounts and which type of accounts (IRA ROTH vs Tranditional ROTH vs 401k, etc) do I open? How much should I contribute per year? (I know this question depends on the amount of cash flow, but what is good amount to contribute for average residents) Any other basic tips on this can help many others who are not familiar with retirement savings accounts. You’re really ahead of the game. I’m glad that you’re thinking about saving & building your net worth beyond tackling student loans. Like I always emphasize in my posts and personal-finance talks, putting your dollar to work early in your career allows your money to work longer and harder for you. Call the human resource or benefits department of your residency program. Ask if your program or employer provides a match for your retirement savings account contribution. If there is a match, you want to set up either a 401(k) or 403 account with your human resources department. Then usually as soon as you start working as an intern, you can contribute a certain percentage, or self-selected amount every paycheck towards this retirement account. There are several important questions to ask when you evaluate how your employer’s match for your program contribution works. You want to inquire about: what is the maximum percentage your employer will match, is the match a dollar (contribution from you, the employee) for a dollar (contribution from your employer), what the vesting period and policies are, Etc. Details to learn about your employer match for retirement savings are listed in my Q&A series on company match, here and here. Assuming you’ve put the amount necessary to obtain the maximum match from your employer, or that your employer does not offer match, the next space that you would like to save for retirement would be a Roth IRA, Roth means post tax contribution, IRA stands for individual retirement account. I recommend saving money in post-tax accounts during residency/ training years, because PGY’s are our lowest income years (most of us will have higher income during attending and retired attending years), and naturally the lowest tax bracket years. 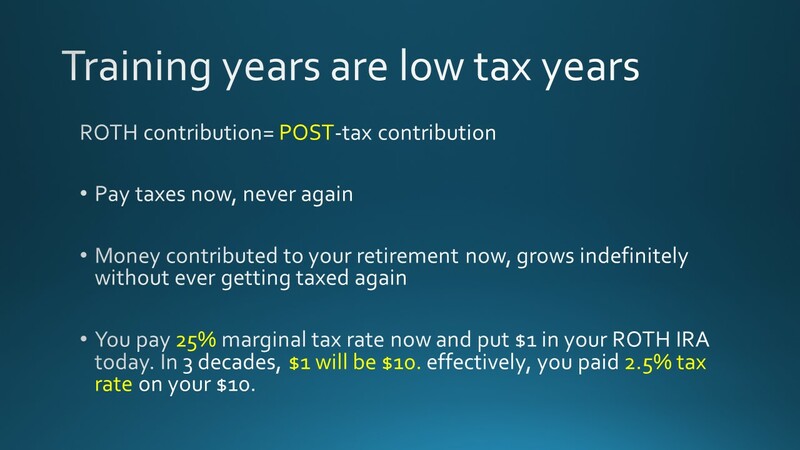 If you pay taxes now on your Roth contribution into your retirement account, this principle amount gets to grow & withdrawn for use in retirement tax-free, according to current legislation. Assuming you put your contribution in an index fund with 7-8% annualized return, in 30 years, your contribution would’ve grown by 10 times. To enjoy the $10, which came from a mere $1 you invested 3 decades ago, you withdraw it without paying any additional taxes as long as you are 59.5 year old. Isn’t this great? It’s like buying nest eggs on sale. Furthermore, if you need to withdraw from your Roth IRA earlier, you can always make sure to only withdraw the principle amount (you contributed), and avoid any taxes or penalties even if you have not reached 59.5 year old. If you manage to contribute and get the maximum match from your employer, AND maximize your contribution to Roth IRA at $5,500 a year, you’re in great shape. At this point, you could consider continually put additional money in the 401(k)/403B account you opened with your employer, because the limit here is $18,000 year. Inquire about if you can elect 401r (Roth) or 403b Roth instead of doing the traditional pre-tax contribution to 401k or 403b. The concept is the same again here. Roth spaces in low income/low taxes years: buy your retirement savings nest eggs on Sale. 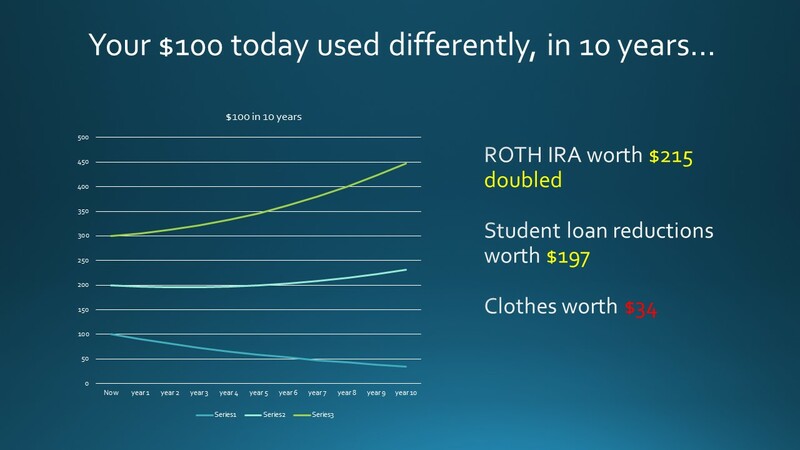 Beyond 1) minimizing student loan interest/paying off student loans, 2) getting employer match, 3) maxing out $5,500 of Roth IRA, and then 4) maxing out $18,000 of 401(k), if you still managed to save more, you can consider other tax-advantage saving vehicles such as 529 college savings plan and or HAS Health savings account, which I will be posting on shortly. Truth is most residents and fellows are not able to contribute maximally into 401k ($18k limit) on top of getting company/employer match and maxing Roth IRA. However when they do refinance during residency, they end up some more cash flow because of a lower monthly payment to student loans, which allow them to save more in their retirement accounts. In general, mathematically, it makes sense to put more money in retirement by refinancing, instead of paying more towards student loans or keep student loan at a higher non-refinanced interest rate. But again everyone situation is different, and it is ultimately a personal choice how to design your personal net worth building plan, which includes debt reduction and asset growth. In short, for your company match, 401(k) or 403b you need to talk with human resources/benefits from your employer. For Roth IRA, you can easily start one online by going to Vanguard; I started one during my intern year and maxed out the $5,500 for year 2014. Let me know if you have any other question. It’s fantastic that you are planning on how to attack your student loans and save money, even before you start making the income as a PGY 1. It’s never too early.